Sergio Makes a Splash, by Edel Rodriguez, is an encouraging story about facing your fears. Edel has illustrated other books, including Float Like a Butterfly, but this is the first time that he has written a book. According to Alvina, from Blue Rose Girls, Edel was inspired to write this story after observing his daughter and other neighborhood children in their backyard swimming pool. 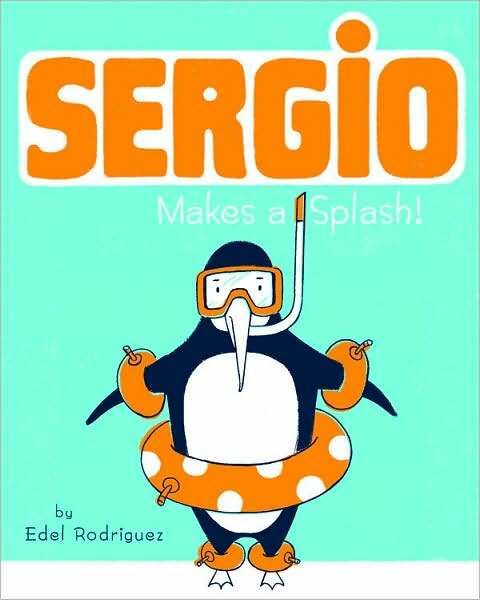 Sergio is such a like-able character, and he makes a wonderful role model for anyone learning to swim – the Kirkus Review calls him an ‘everypenguin’. The bottom line … who can resist a penguin? My two year old, who is very hesitant in a pool or the ocean, adores Sergio and his courage. Keep your eyes open in Spring of ’09 for Sergio Saves the Game, in which Sergio will be playing soccer.